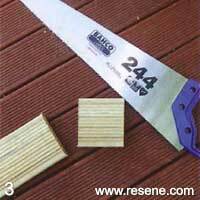 Mark Rayner offers two solutions to clean up a tired deck and replace a damaged decking plank. Top tip: Though the newly stained plank will look darker for a while, it will eventually weather to the same colour as the rest of the deck, but if you want an instant match, simply give the rest of the deck a freshen up with one coat of deck stain. 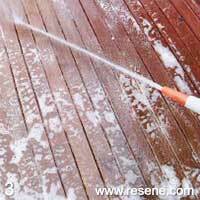 You will need: Broom, bucket, hose with running water, stiff-bristled brush, timber-cleaning agent, we used Resene Timber and Deck Wash. 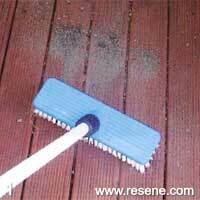 Sweep the deck clean of any dry dirt and debris. Dilute the timber-cleaning agent with fresh water, following the recommendations. 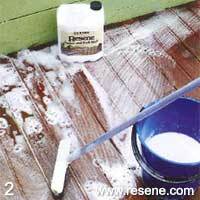 Thoroughly scrub the soapy solution into the decking. 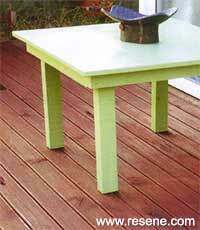 Allow the wood to remain wet for around 15 minutes and then rinse thoroughly with clean water. Allow to dry. 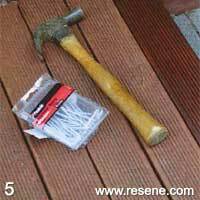 You will need: 75mm galvanised decking nails, crowbar (or similar) for removing damaged plank, hammer, paintbrush, pencil, ruler, sandpaper, saw, wood stain (to match the rest of deck), new piece of decking (to match original). 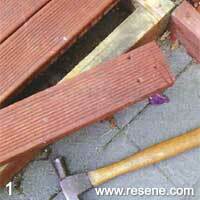 Using the hammer and crowbar, remove the broken decking plank, lifting from one end. Take care not to damage the adjoining planks. Measure and mark the new piece of the decking to fit, using the back of the saw to rule an accurate 90° cutting line across the plank. 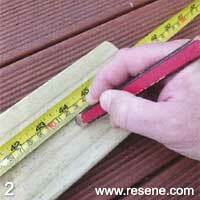 Cut the piece of decking using the pencil line as a guide and smooth the cut edge with sandpaper. 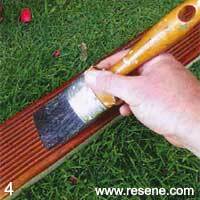 Apply two coats of wood stain to the new plank, following the manufacturer's recommendations. Allow to dry. Fix the new plank into position with 75mm deck nails.